Blessed Lughnasadh & Di Wep Ronpet Nefer*! This is the time of year where we celebrate the harvest. For some this is the old Celtic festival of Lughnasadh. For people like me, who follow the ancient Kemetic (Egyptian) religion, we call it Wep Ronpet, the ancient equivalent of New Year when the Helical rising of Sirius also occurs. 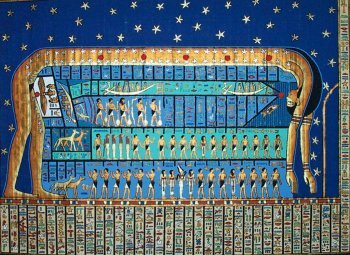 For several days we celebrate the “non days” where the Goddess Nut gives birth to Wasir (Osiris), Heru Wer (Horus the Elder), Set, Aset (Isis) and NebtHet (Nephthys). Then on the sunrise after NebtHet’s night, as we Kemetics affectionately call it, we smite the Apep (Apophis) Serpent and beat back the enemies of Ra. The climax of this comes in the form of an execration ritual where this malevolent being of Un-Creation is destroyed and turned back through the efforts of both humans and the Gods. When it is all done, then there is much feasting and rejoicing. Since coming to the very first Retreat for the House of Netjer in 1998, it has always been a time of intensity, of getting to see folks that you may only get to see once a year. It is an event that is a mad scramble up to the end no matter how much planning goes on the year before, and it is one where the days melt by far too quickly. Sadly, I missed this year and last. But I have a renewed hope in the coming year because of the Deity that is linked to be over this particular year; the Goddess Nut. Nut has been seen within the ancient Egyptian symbolic language since the earliest times of its history. She is also sometimes depicted as the Celestial Cow, which is a form of Hathor. With this year comes hope and creativity, diligence and ultimately of contentent. To quote another Shemsu (follower) in the Temple, ‘…these things are her gifts to us.’ In these uncertain times I like the sound of that.